مرادی, مجتبی, خبیری, محمدمهدی, فلاح نژاد, محمدصابر. (1396). تعیین و اولویت‌بندی مؤلفه‌های مؤثر بر تقاضای حمل‌ونقل هوایی داخلی از دیدگاه مسافرین. پژوهشنامه حمل و نقل, 14(3), 81-93. مجتبی مرادی; محمدمهدی خبیری; محمدصابر فلاح نژاد. "تعیین و اولویت‌بندی مؤلفه‌های مؤثر بر تقاضای حمل‌ونقل هوایی داخلی از دیدگاه مسافرین". پژوهشنامه حمل و نقل, 14, 3, 1396, 81-93. مرادی, مجتبی, خبیری, محمدمهدی, فلاح نژاد, محمدصابر. (1396). 'تعیین و اولویت‌بندی مؤلفه‌های مؤثر بر تقاضای حمل‌ونقل هوایی داخلی از دیدگاه مسافرین', پژوهشنامه حمل و نقل, 14(3), pp. 81-93. مرادی, مجتبی, خبیری, محمدمهدی, فلاح نژاد, محمدصابر. تعیین و اولویت‌بندی مؤلفه‌های مؤثر بر تقاضای حمل‌ونقل هوایی داخلی از دیدگاه مسافرین. پژوهشنامه حمل و نقل, 1396; 14(3): 81-93. ازآنجایی‌که میزان تقاضا در سیستم حمل‌ونقل هوایی بیشترین تأثیر را در افزایش رونق و کارایی این سیستم دارند، شناخت عواملی که سبب جذب مسافران به سمت سیستم حمل‌ونقل هوایی می‌شود، الزامی است. این موضوع در کشورهای در حال توسعه در سال‌های اخیر به جهت نرخ رشد آهسته تعداد مسافران پروازهای داخلی اهمیت بالایی پیداکرده است. در این پژوهش که به شناخت عوامل مؤثر بر تقاضای حمل‌ونقل هوایی داخلی می پردازد، جهت جمع‌آوری اطلاعات موردنیاز از مسافران حمل‌ونقل هوایی، با استفاده از نظرات مشاوران صاحب‌نظر و اساتید دانشگاه و همچنین مطالعه تحقیقات گذشتگان، پرسشنامه‌ای شامل 20 پارامتر مؤثر بر تقاضای حمل‌ونقل هوایی طراحی شد و از مسافران خواسته شد که بر اساس اهمیت هر یک از پارامترها، آن‌ها را رتبه‌بندی کنند. این پارامترها بر اساس میزان اهمیت با استفاده از آنالیز تحلیل عاملی در 6 عامل به ترتیب "هزینه" ،"خدمات" ،"زمان" ،"استفاده از تکنولوژی به‌روز"، "رضایتمندی و خدمات ثانویه" و"ایمنی" دسته‌بندی‌شد‌اند.عوامل به دست آمده به میزان7/67 درصد در تغییرات تقاضا مسافران حمل‌ونقل هوایی داخلی مؤثر بوده‌اند که عامل هزینه با 4/20 درصد بیشترین تأثیر را داشته است. 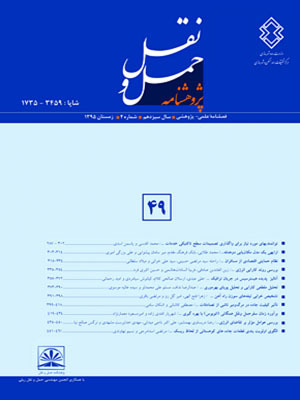 به‌منظور بررسی صحت نتایج تحلیل عاملی، از روش معادلات ساختاری استفاده‌شده است؛ نتایج این معادلات صحیح بودن تحلیل عاملی را اثبات کرد؛همچنین مدلسازی نشان داده است که بیشترین تاثیر گذاری متقابل بین دو عامل هزینه و خدمات با میزان تاثیر گذاری 18/0 بوده است. نتایج این پژوهش مفاهیم کاربردی را برای شرکت‌های فرودگاهی و هواپیمایی درزمینه برنامه‌ریزی حمل‌ونقل هوایی، افزایش جذب تقاضا مسافران و درنهایت بهبود شرایط اقتصادی در تقاضای حمل ونقل هوایی ملی بیان می‌کند. Since the demand in air transport system has the most influence on increasing prosperity and efficiency of this system, identifying the factors that attracts the passengers to air transport is essential. This topic has got an importance in developing countries in recent years because of the slow growth rate of number of domestic flight passengers. In this research which surveys the effective factors on demand of domestic air transport, for gathering required information from passengers, a questionnaire was designed including 20 effective parameters on air transport demand based on consulting experts, university professors and past research studies. It was asked from the passengers to rank the parameters according to their importance. These parameters were categorized using “Factor Analysis” with 6 factors of “cost”, “services”, “time”, “application of up-to-date technology”, “satisfactory and secondary services” and “safety” respectively. Obtained factors were 67.7% effective on changing passenger demands of domestic air transport. The factor “cost” has had the greatest impact with 20.4 %. “Structural Equation Modeling” has been used for checking the “Factor Analysis” results. Modeling results proved the correctness of factor analysis. Furthermore, the modeling has showed that the most mutual effectiveness has been between the factors “cost” and “services” with the value of 0.18. The results of this research express practical implications for airport Companies and airlines in the field of programming air transport, increasing demand attraction of passengers and eventually improvement of economic conditions at a national level. Anand S. (2014), “Application of Factor Analysis to kmeans Clustering Algorithm on Transportation Data”. International Journal of Computer Applications 95: pp.40-46. -Bezerra G, Gomes C. (2015), “The effects of service quality dimensions and passenger characteristics on passenger­' s overall satisfaction with an airport”. Journal of Air Transport Management 45: pp.77-81. -Bieger T, Wittmer A, Laesser C. (2007), “What is driving the continued growth in demand for air travel ? Customer value of air transport”. Journal of Air Transport Management 13: pp.31-36. -Cipriani E, Crescenzi L, Nigro M. (2014), “Behavioral models for the estimation of the air transport demand:the case study of Rome-London flight connection”. Social and Behavioral Sciences 111: 78-764. doi: 10.1016/j.sbspro.2014.01.040. -Israel G. (2013), “Determining Sample Size 1. University of Florida”, pp.1-5. -Janic M. Reprint of (2015), ‘‘Modelling the resilience, friability and costs of an air transport network affected by a large-scale disruptive event’’. Transportation Research Part A, 71: pp.77-92. resilhttp://dx.doi.org/10.1016/j.tra.2015.07.012. -Khabiri, M. M. (2016), "­The Application of Factor Analysis to Determine the Parameters of Planning Work-Zone in the Road Repair and Maintenance". International Journal of Sustainable Construction Engineering and Technology, 7(1), pp.1-10. -Li T, Trani A. (2014), “A model to forecast airport-level General Aviation demand”. Journal of Air Transport Management 40: pp.192-206. -Liu D. (2016), “Measuring aeronautical service ef fi ciency and commercial service efficiency of East Asia airport companies : An application of Network Data Envelopment Analysis”. Journal of Air Transport Management, 52: pp.11-22. -Lupo T. (2014), “Fuzzy ServPerf model combined with ELECTRE III to comparatively evaluate service quality of international airports in Sicily”. Journal of Air Transport Management, 30: pp.1-11. -Marazzo M, Scherre R, Fernandes E. (2010), “Air transport demand and economic growth in Brazil : A time series analysis”. Transportation Research Part E,46: pp.261-269. doi:10.1016/j.tre.2009.08.008. -Navarro J, Martínez M, (2015), “Trinquecoste JThe effect of the economic crisis on the behaviour of airline ticket prices”. A case-study analysis of the New York-Madrid route. Journal of Air Transport Management, 47: pp.48-53. -Orth H, Frei O, Weidmann U. (2014), “Effects of non-aeronautical activities at airports on the public transport access system­: A case study of Zurich Airport”. Journal of Air Transport Management 30: pp.1-10. http://dx.doi.org/10.1016/j.jairtraman.2014.07.011. -Scarpel R. (2014), “A demand trend change early warning forecast model for the city of São Paulo multi-airport system”. Transportation Research Part A 65: pp.23-32. http://dx.doi.org/10.1016/j.tra.2014.04.007. -Scotti D, Dresner M. (2015), “The impact of baggage fees on passenger demand on US air routes. Transport Policy 43: pp.4-10. http://dx.doi.org/10.1016/j.tranpol.2015.05.017. -Sherry L. (2015), “A method for quantifying travel productivity for corporate travel managers”. Journal of Air Transport Management, 42: pp.118-124.http://dx.doi.org/10.1016/j.jairtraman.2014.09.012. -Valdes V. (2014), “Determinants of air travel demand in Middle Income Countries”. Journal of Air Transport Management, 42: pp.1-10. http://dx.doi.org/10.1016/j.jairtraman.2014.09.002. -Xiao Y, Fu X, Zhang (2013), “A. Demand uncertainty and airport capacity choice”. Transportation Research Part B 2013; 57: 91-104. http://dx.doi.org/10.1016/j.trb.2013.08.014. -Yang H, Fu X. A comparison of price-cap and light-handed airport regulation with demand uncertainty. Transportation Research Part B., 73: pp.122-132. http://dx.doi.org/10.1016/j.trb.2015.02.002.